Afghan militant Gulbuddin Hekmatyar has previously expressed support for al Qaeda. (CNN) -- Afghan President Hamid Karzai has held talks with representatives of a major insurgent group whose leader is known for anti-U.S. rhetoric and support for al Qaeda, officials said Monday. Karzai's deputy spokesman Hamed Elmi told CNN the delegation from the Hizb-i-Islami group of maverick militant Gulbuddin Hekmatyar, which has been behind numerous deadly attacks in Afghanistan, had submitted a peace plan. "We can confirm that the delegation is in Kabul, they have met with the president and they have a plan with them," Elmi said, adding that he had no knowledge of the plan's contents or any timeline for a government response. "They have submitted the plan, we're looking at it and analyzing it and will make a decision when we've had time to read it." Candace Rondeaux, a senior analyst with the International Crisis Group, described the talks as a "significant" step with global pressure mounting on Afghanistan to reconcile with insurgents as coalition troops plan their exit. "It's certainly significant in the sense that the door is now open," she told CNN. "The conversation about reconciliation has been catch-as-you can for the past 10 years but now the deadline to come up with some sort of resolution is really apparent, the pace has quickened." However she said it would not necessarily pave the way for talks with the Taliban that Karzai's government has been seeking for several months. Hekmatyar, a former prime minister who was a key figure in resistance to Soviet occupation of Afghanistan in the 1980s, has long been a thorn in the side of coalition forces struggling to make headway in their battle against the Taliban. Once regarded by the Pentagon as a key military player, he has constantly shifted allegiances, at times expressing support for both the Taliban and al Qaeda, but also a willingness to work with the government if U.S. and NATO forces quit the country. 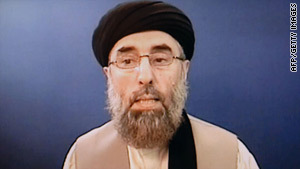 In a 2006 video message, Hekmatyar pledged backing for al Qaeda's leaders and promised to carry on the fight alongside them against the "infidels." He also called on Afghans to join the fight against U.S.-led troops. Analysts say Hekmatyar's influence over Hizb-i-Islami may have waned in recent years as the group tries to legitimize itself as a political force in several Afghan regions, but he remains a potent threat to stability. "He does have military forces at his command and he can make a lot of trouble," Rondeaux added. The talks with Hizb-i-Islami came as NATO-led troops suffered their latest casualty with the death of a British soldier in Helmand province -- the main theater of operations for a major international push against the Taliban. -- CNN's Barry Neild contributed to this report.